The Standard A.R.C. (Appendix Reversible Carry) IWB (Inside Waistband) holster by Blackhawk has been designed to be an economical and comfortable yet very versatile concealed holster for both professionals and civilians. This holster is entirely reversible, accommodating both left- or right-handed users thanks to its two belt clips and adjustable retention detent. The two adjustable belt clips can fit belts measuring 1.5 to 1.75 inches wide and allow you to tweak the cant and the ride. It has been constructed using soft, durable injection-molded polymer to keep it comfy yet it can still hold pistols with rear-mounted sights. It fastens using a passive retention detent with an adjustment screw for personalized friction. Blackhawk, a Vista Outdoor, Inc. brand, is one of the most recognizable and trusted names in tactical gear and apparel. 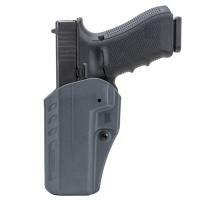 Concealed carry holster holds a single pistol at appendix level. Fully ambidextrous design allows for left- and right-hand use. Takes some getting used to but overall a great fit.